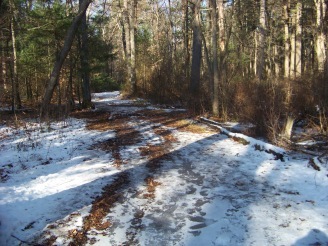 In Ames Nowell State Park there are many hiking trails. 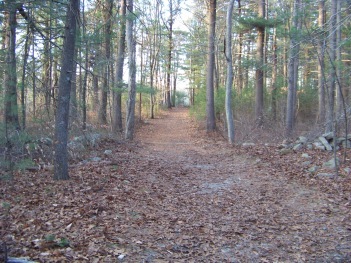 I am calling this the dog walk trail because it seems almost everyone who takes a dog in this park follows this route. trail is shown in green. From the parking lot turn right following the main trail into the park. This will go over a small stream. Then it passes the field where the swings formerly stood. 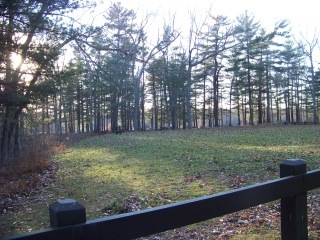 It is the closest field to the entrance and lined by a fence. 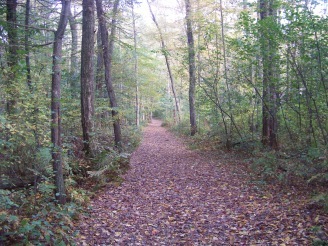 The Dog Walk Trail takes a right into the forest and is one of the trails that has been marked by the state park. 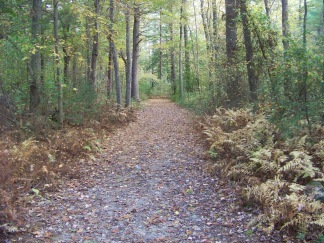 Taking this dirt road trail to the right will bring you past the boy scout pavilion. Another field will open up on your left. 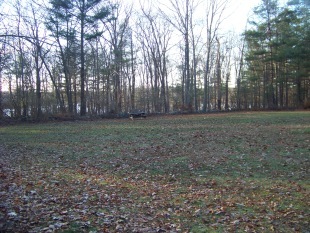 At the far left corner of this field is a plank walk to the pavilion. 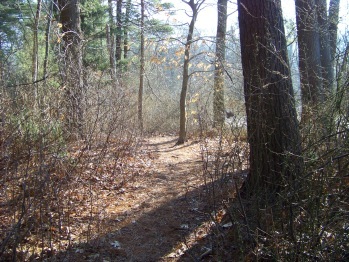 The trail is mostly an easy walk through the forest. 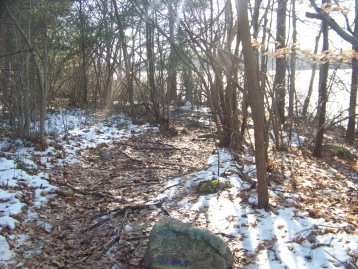 You will pass by trails on the right that will take you to an auxiliary parking lot that is rarely open now. There are actually two extra parking lots. 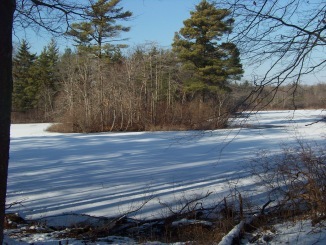 You will pass by another notable area where in the fall, winter and early spring good views of Cleveland pond open up. 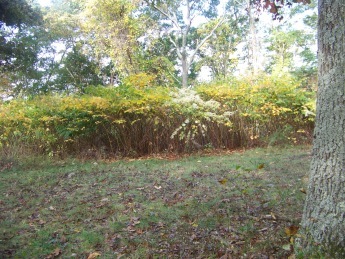 Most summer months though, it is heavy with flowering vegetation. 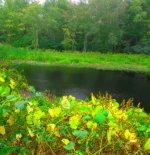 There was a bench here that was great for viewing the pond and I often think this spot would be a great place for a campsite. Carry in only of course!!. Apparently the bench was either removed??? ?Or stolen??? 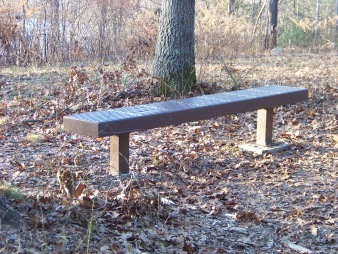 It was a great place to sit in any season!!! this will also become a bit rocky and wet in some seasons. 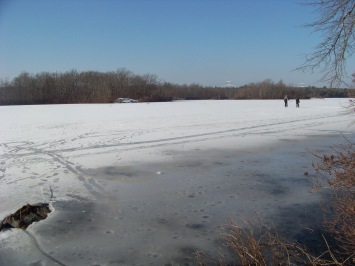 In winter it can be a skating field. 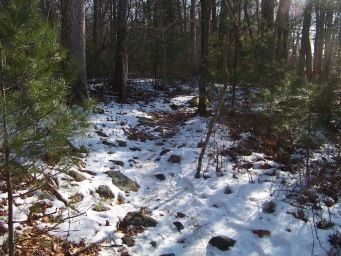 then in winter it is highly suggested you bring them along on the dog walk trail. 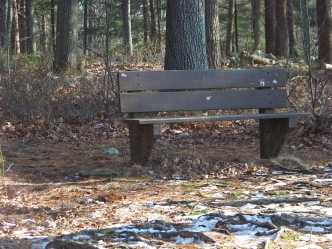 with a picnic table and bench beside an opening by Cleveland Pond. 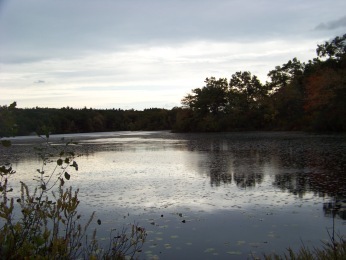 From here is the closest point to the largest island of several on this pond. 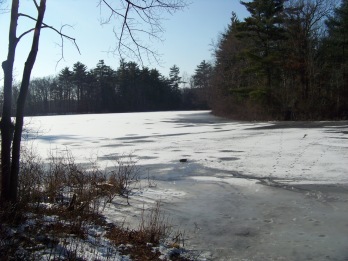 In winter if the ice has frozen solid enough you can just walk over to the island to explore. 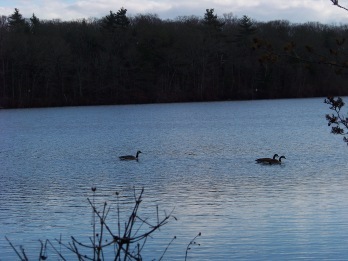 Stop for a few minutes and watch the ducks or geese. 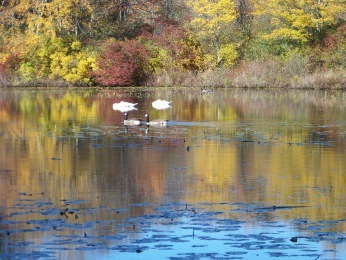 Hopefully you'll catch a glimpse of the swan couple that reside on the pond. 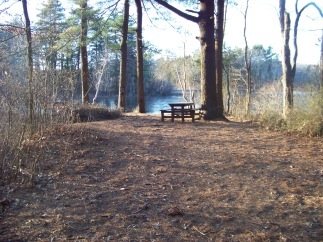 At this point you will turn around and take a smaller hiking trail to the right that runs along Cleveland pond. 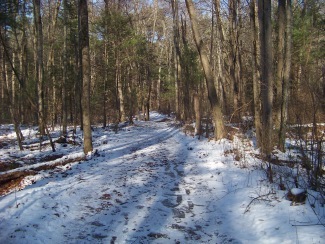 This portion of the dog walk trail, for some reason, many on mountain bikes like to use, though it is really more for hiking. From the picture above I can see why they are enticed to use it. 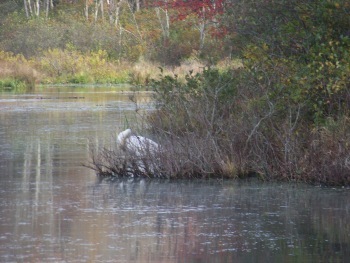 as it runs along the pond shore line giving more great views of the islands in the middle of Cleveland pond. 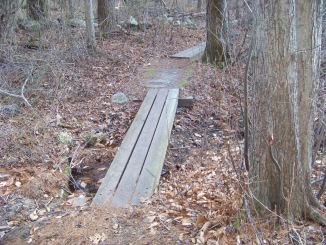 and becomes more difficult to hike. 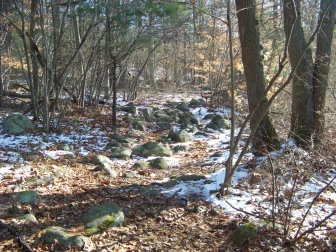 Many roots and rocks litter the trail. 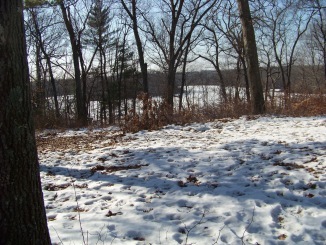 and different parts of the state park. 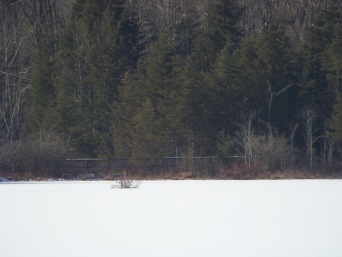 LOOK CAREFULLY YOU CAN SEE THE REMOTE BOARDWALK ACROSS THE FROZEN POND. If you happen to be wandering on these hiking trails on a Sunday, you will hear gun shots in the near distance. That is the sound of target practice at the Holbrook Gun and Rod club located on North Quincy St just into Holbrook. The trail continues winding along the shore and increasingly more root bound and rocky. 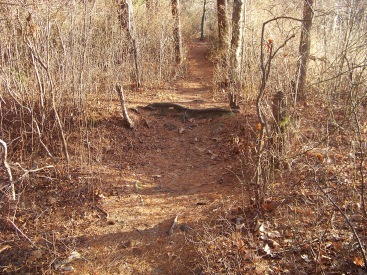 This is where those who chose to mountain bike on this portion of the dog walk trail find that it is difficult to finish to the end. It is difficult enough just walking at this point! 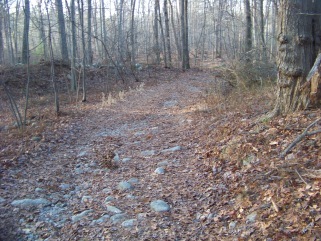 Fortunately there are many side trails that lead up hill to the original "road". Some though, are quite steep. The trail leads by a couple of interesting depressions in the earth. Were they formed by ice broken off from glaciers in the area or simply from erosion of running water after storms and snow melting in the spring?? 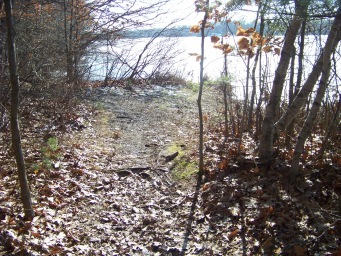 The trail separates in two around one of these depressions. 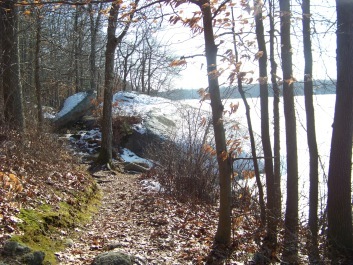 Then the trail leads to a large boulder that is a popular fishing spot in the warmer months. 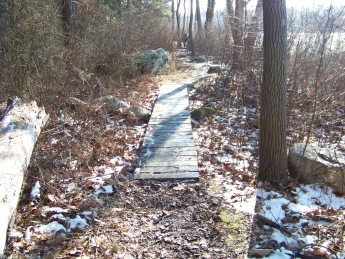 this section of the trail in the warmer months will have a considerable amount of bugs due to how close to the pond it runs. 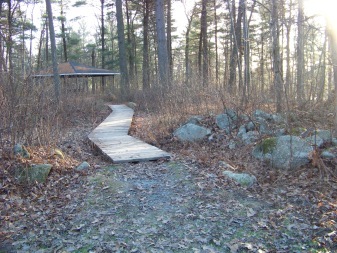 Not long after the fishing rock the trail will open out to the other side of the boy scout pavilion. There is a trail that will bring up up to that if you wish. 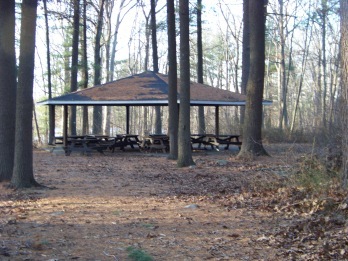 main picnic area with a bench to rest at. 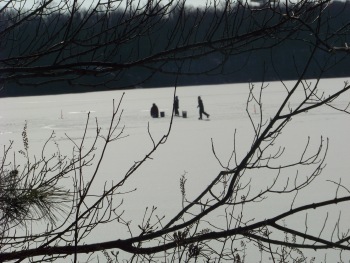 My winter day on the hiking trails included watching some brave souls out ice fishing and skating. 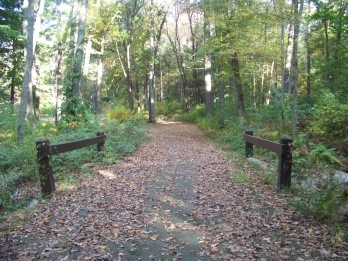 To explore more of this park you can cross the picnic area and over the bridge and dam to more hiking trails. From Boston heading south on route 93 to route 3 at split take exit 16 south on route 18 approx. 5 miles. Take right at intersection of route 139 (West). Take 2nd left on Lincoln and follow to end with a left on Hancock st. Take 2nd right on Presidential Dr. following to end and right on Linwood st. State Park is on the end of Linwood. 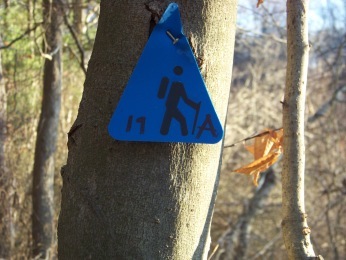 many trails whereby any length of time can be arranged depending upon hike chosen. 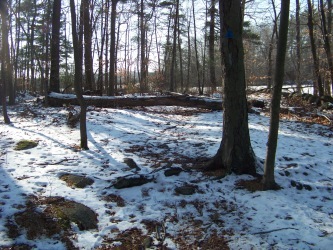 some areas along shore get very rocky or root filled. Several, primarily Cleveland Pond. 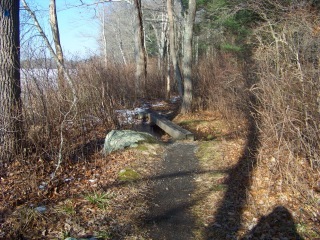 There are a couple seasonal water sources along this route. The first leg of this journey is a dirt road. Good for cross country skiing. 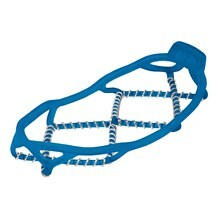 Snow shoe the whole route. Mountain bike the first leg.